I find scholarly environments too protective of orthodoxy to generate powerful new descriptives, especially in the world of United States academia…perhaps the contingency theorists were right, our students should realise that if they do not start generating radical, new, and progressive institutional ideas themselves, no one else will. Raul Lejano is a policy scholar and Associate Professor at New York University in the Department of Teaching and Learning, Environmental Conservation Education. Research interest: integrative modes of policy analysis that capture complex ways of knowing the environment; social ecology of urban resilience and the logics of collective action. Lejano, Raul and Francisco Fernandez de Castro (2014), “Norm, network, and commons: The invisible hand of community,” Environmental Science & Policy 36:73-85. Lejano, Raul, Eduardo Araral, and Dianne Araral (2014), “Introduction to the special issue: Interrogating the commons,” Environmental Science & Policy 36:1-7. Lian, Hongping and Raul Lejano (2014), “Interpreting institutional fit: Urbanization, development, and China’s “land-lost”,” World Development 61:1-10. Ingram, Mrill, Helen Ingram, and Raul Lejano (2014), " "What’s the story? Creating and sustaining environmental networks," Environmental Politics (in press). 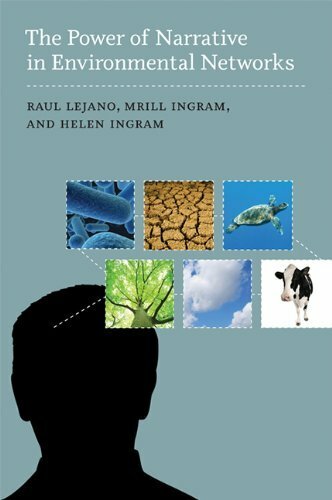 Lejano, Raul, Mrill Ingram, and Helen Ingram (2013), The Power of Narrative in Environmental Networks, MIT Press, Cambridge, Mass. Lejano, Raul, Joana Tavares-Reager, and Fikret Berkes (2013), “Climate and narrative: Environmental knowledge in everyday life, “ Environmental Science & Policy 31:61-70. Howlett, M., & Lejano, R. P. (2013). “Tales from the crypt: The rise and fall (and rebirth?) of policy design,” Administration & Society, 45(3):357-381. Goldstein, B., A. Taufen Wessells, R. Lejano, and W. Butler (2013), “Narrating resilience: Transforming urban systems through collaborative storytelling,” Urban Studies (in press). Lee, E., R. Lejano, and R. Connelly (2013), “Regulation-by-information in areas of limited statehood: Lessons from the Philippines’ environmental regulation,”Regulation & Governance 7(3):387-405. Lejano, Raul and Savita Shankar (2013), “The contextualist turn and schematics of institutional fit: Theory and a case study from Southern India,” Policy Sciences 46(1):83-102. Lejano, Raul and Daniel Stokols (2013), “Social ecology, sustainability, and economics,” Ecological Economics 89:1-6. Park, S.J., D. Ogunseitan, and R. Lejano (2013), “Dempster-Shafer theory applied to regulatory decision-making for safer alternatives to toxic chemicals in consumer products,: Integrated Environmental Assessment & Management (accepted, in press). Stokols, D., R. Lejano, & J. Hipp (2012), “Enhancing the resilience of human-environment systems: A social ecological perspective,” Ecology & Society 18(1):7. Lejano, Raul and Ching Leong (2012), “A hermeneutic approach to explaining and understanding public controversies,” JPART Journal of Public Administration Research & Theory 22 (4): 793-814. Raul P. Lejano is a policy scholar and Associate Professor at New York University (NYU) in the Department of Teaching and Learning, Environmental Conservation Education. Research interest: integrative modes of policy analysis that capture complex ways of knowing the environment; social ecology of urban resilience and the logics of collective action. Prior to joining the Steinhardt School at NYU, Dr. Lejano held faculty appointments at UC Irvine and at the University of Hong Kong. His foremost research interests involve understanding people’s deep engagements with community and environment, and reflecting such in how we design policy and institutions from a relational perspective. 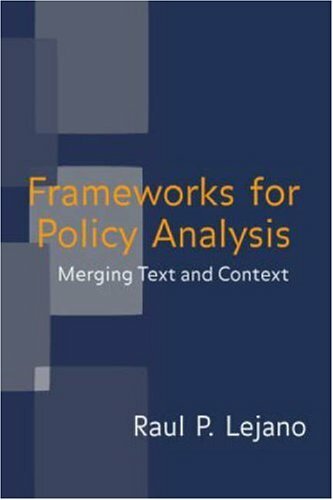 Beginning with his first book, Frameworks for Policy Analysis: Merging Text and Context (Routledge), Dr. Lejano has developed approaches for integrating multiple analytical lenses in interpreting environmental situations. In his latest (co-authored) book, The Power of Narrative in Environmental Networks (MIT Press), a theory is advanced regarding the unique capacity of narrative to capture complex human motivations and human-nonhuman relationships. His work in the area of environmental education emphasizes how ecological knowledge emerges from the capacity of a person to build relationships with others --his emerging theory of environmental cognisance. Since people’s motivations are never merely utilitarian or affective or ethical, policies cannot be so simplistically designed. As an example, cities need to be analyzed not merely in objective terms but as a web of relationships. His latest work involves the role of narrative and relationality in moving people to act on climate change. His work on collective action also appears in a special issue of Environmental Science & Policy, entitled Interrogating the Commons, which he co-edited. Dr. Lejano's work has earned him the Daniel Stokols Award for Interdisciplinary Research, among other honors. He has served on the Editorial Board of Budhi: A Journal of Ideas and Culture since 2006 and on the Board of Directors for Communities for a Better Environment. His many ongoing professional collaborations include work with the World Health Organization's Disaster Risk Reduction in the Western Pacific, consultancy for the Philippine Department of Agriculture and National Economic, and collaboration with Urban Barrio Collaborative (CSUF) in Santa Ana, CA. The MIT Department of Urban Studies and Planning (DUSP) hosted Dr. Lejano as an MLK Visiting Professor from 2000 to 2002.